1) 64-bit native optimization for Windows extends the performance of ArchiCAD 13 so that there is almost “no limit” to how much memory can be assigned to the computer, very useful with BIM models. 2) Annotated schedule drawings: Annotative schedule drawings help with the tedium of architectural work, where beyond the plans and drawings it is necessary to create a bill of materials, and annotations. 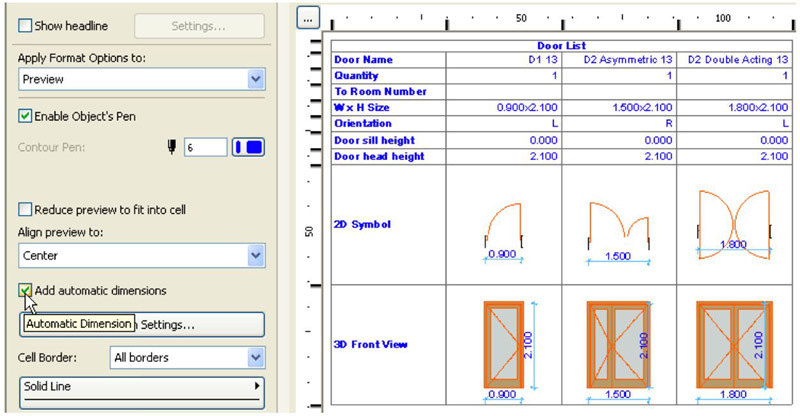 In ArchiCAD 13 door and window previews can be annotated associatively, right in the Interactive Schedule window. Changes in floor plan or schedule will also be updated automatically. 3) Intelligent “Soft” Insulation for fills cannot be solved with simple hatches since they are curved. On connections and wall corners there were always problems with orientation. ArchiCAD 13’s dynamic soft insulation removes the need to create 2D hatches in wall corners. The composite structures solve it in both 2D and 3D documents. 4) Slab and roof edges are now fully editable as far as slant, angle, building material on the edges, etc. 5) Curtain wall editing capabilities are now improved so architects can edit geometry more freely, adding capability to the curtain wall system tool introduced in ArchiCAD 12. 6) Oriented views – In many cases, users want to rotate the view itself but not the whole project. The oriented view function in ArchiCAD 13 allows users to make certain views oriented into the perpendicular position so it’s easier for them to edit, and works on layouts so users can arrange different parts of buildings aligned in the same perpendicular orientation. This is integrated into the whole BIM environment. Pricing for Graphisoft ArchiCAD 13 including the BIM Server is US$4,250. Autodesk announced the availability of AutoCAD Plant 3D 2010, a new software product that brings the proven benefits of model-based design to mainstream plant design projects. Purpose-built for the design, modeling, and documentation of process plants, AutoCAD Plant 3D makes modern 3D design more affordable and accessible to project teams of all sizes. The announcement was made at the SPE Offshore Europe Oil & Gas Conference & Exhibition 2009. Nemetschek North America announced the 2010 release of their award-winning Vectorworks line of design software, including: Designer, Architect, Landmark, Spotlight, Machine Design, Fundamentals, and Renderworks. 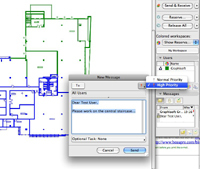 "Making Change Easy" is the theme for the Vectorworks 2010 product line. Building upon the integration of the Parasolid 3D modeling core in 2009, version 2010 is making change easy with the addition of bi-directional associativity features and an intuitive, easy-to-approach 3D modeling environment. These capabilities ensure that changes are intelligently reflected throughout the entire design which is a cornerstone for information modeling workflows in the building industry and beyond. Meridian Systems announced that the U.S. General Services Administration (GSA) Public Buildings Service (PBS) has awarded Meridian Systems an additional contract to address new requirements as a result of the American Recovery and Reinvestment Act (ARRA) and to accelerate field training and deployment of the electronic project management (ePM) solution that is built upon Proliance software from Meridian Systems. FM:Systems, a provider of integrated workplace management systems (IWMS) and computer-aided facility management (CAFM) software, announced its partnership with CADD Microsystems, Inc. (CMI), a solutions provider in civil engineering, building architecture, federal government, and state and local government. The partnership enables CMI to offer its clients FM:Systems facility management products to deliver better customer service, reduce costs, and improve the productivity of their entire organization. 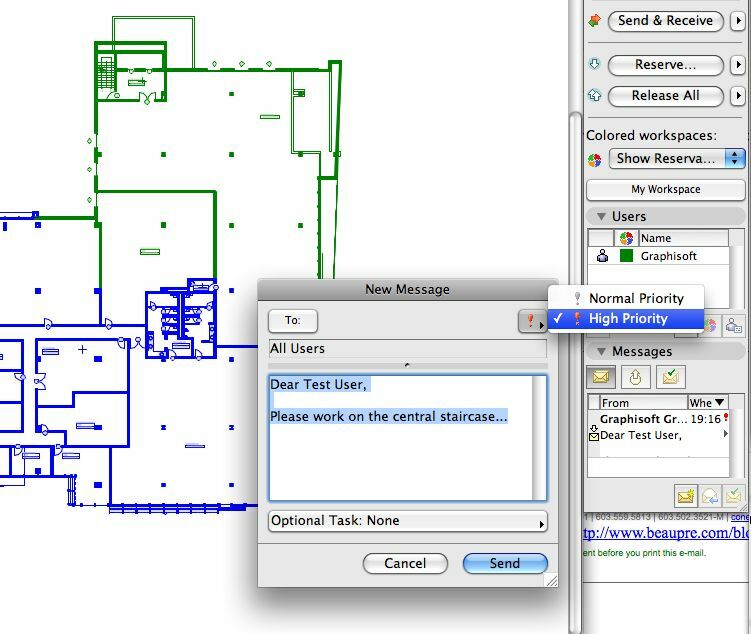 Leica Geosystems AG, global leader of survey technology and Bricsys NV, developer of Bricscad announced that the latest release of Bricscad now supports the Leica DISTO D8 plug-in, formerly only running on AutoCAD. The Leica DISTO D8 is the most advanced handheld laser measurement device ever made. Equipped with a digital Pointfinder (4x zoom), high-resolution 2.4“ color display, 360° tilt sensor and BLUETHOOTH technology, the Leica DISTO D8 is a real world first and offers completely new measuring options. “Surviving and Thriving in Today’s Construction Industry” is the theme and focus of the 9th Annual National Conference of Construction Owners, being held at the Buena Vista Palace Hotel in Orlando, Florida from November 16-18, 2009. Given the importance of the industry at this point in our economy, and the value and timeliness of the information to be transmitted at this event, for the first time in the 9-year history of this conference, the press and media are being invited to attend. For additional information see the website. Avatech launched the Render Us Speechless contest to recognize the best digital rendering and visualization designers who use Autodesk design and engineering software. This year Avatech is accepting submissions in four categories: Manufacturing/Mechanical, Civil/Mapping/GIS, Architecture/Building Design, and “Wild Card.” Each category will be awarded a first place of $750, second place of $500, and third place of $250. One Wild Card (submissions that don’t fit into any of the other three categories) winning entry will receive $500. Avatech Solutions, Inc. announced the introduction of its latest service to its client base—the Avatech Client Portal. Designed as a destination for Avatech’s client base, the Client Portal will provide 24/7 instant access to information and services of special interest to Avatech clients. Autodesk, Inc. is expanding its support for students and educators as they return to campus. Autodesk has announced that it is increasing access to its 2010 offerings, valuable curricula and additional resources for student and teacher communities. Dimension 3D Printing, a brand of Stratasys Inc. announced the launch of its sixth annual “ Extreme Redesign: The Ultimate 3D Printing Challenge.” The contest challenges computer-aided-design (CAD) students worldwide to submit their most creative, useful and innovative Extreme Redesigns – whether an entirely original concept, a new perspective on an everyday product or a fresh vision for a famous piece of art, animation or architecture. The Dimension uPrint Personal 3D Printer has been named Best Product Winner in Design News magazine's 2009 Golden Mousetrap Awards. The award recognizes new and innovative products that help design engineers, and uPrint was selected from a record number of entries. Bentley Systems, Incorporated has appointed Cyndi Smith, based in Tulsa, Okla., to the position of solutions executive for utilities and communications; Mark Biagi, based in Edinburgh, United Kingdom, to the position of solutions executive for power generation; and John Sanins, based in Houston, Texas, to the position of solutions executive for process manufacturing. In these roles, each will establish an integrated suite of software products and professional services that supports the infrastructure lifecycle of the solutions communities for which he or she is responsible. Deltek, Inc., provider of enterprise applications software for project-focused businesses, announced that it has appointed Jim Dellamore as its new Executive Vice President, Global Services. In this position, Mr. Dellamore will be responsible for the strategic and operational direction of Deltek’s Global Services organization. Mr. Dellamore will report directly to Kevin Parker, Deltek’s president and CEO. Riverbed Technology announced the promotion of Venugopal Pai to vice president of global alliances. In this role Pai will continue to outline the strategy and oversee execution of the alliances program, including jointly developing, marketing and delivering solutions to enterprise customers, thereby driving value to all the companies within the alliances ecosystem. Matrox Video Products Group announced Matrox MXO2 LE, an HDMI, SDI, and analog I/O device for the Mac based on the award-winning Matrox MXO2 that streamlines editing with Apple Final Cut Studio on Mac Pros and MacBook Pros. Matrox MXO2 LE provides all the features of an I/O card in a sturdy, portable breakout box with professional audio and video connectivity. Matrox MXO2 LE is also available with Matrox MAX technology for faster than realtime H.264 encoding using professional application such as Apple Compressor and Telestream Episode.